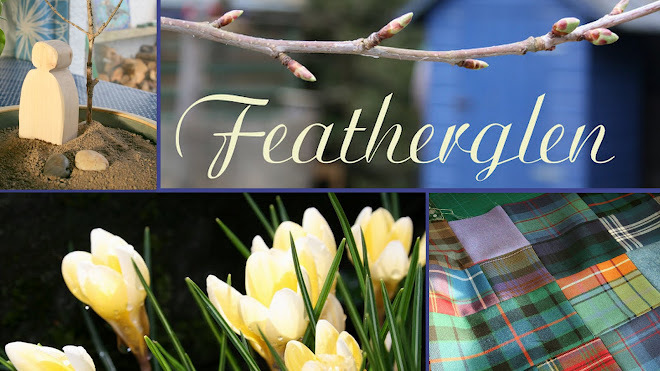 Featherglen: Just in time for Advent! The last time I took any photos was back in early September - a glorious day spent on a local beach - the pictures tell of swimming, rock-pooling, kite flying, beach combing and frying up bacon and mushrooms for sandwiches. What the pictures don't say is that there was a very strong wind that day or that sand got into my camera lens. The poor thing was understandably rather unhappy and made ominous crunching sounds. Oh dear....Three months later and one (almost) new lens later and I'm reunited with my precious camera again, feeling wiser and poorer! So in the record of our family life we go straight from sand to snow, and right into Advent. The autumn has been a strange one anyway, and I have a lot to ponder this season. My husband was diagnosed with a form of epilepsy, which causes him to have a type of 'absence' for a couple of minutes at a time. We had seen the symptoms building up for a while, with no conclusive diagnosis last year, but with time it became obvious. Actually having this diagnosis gives us a lot of peace, because it could be a lot worse, and the medication he is able to take is working brilliantly well. The only downside really is that he is unable to drive this year, which sometimes requires a bit of planning, but we have been so grateful for assistance from friends, who have also been praying deeply with us. Thom has had to make various adjustments to his life, especially to have more rest, but in some ways it feels like a season of growth for him. For me, Advent is very welcome, reminding me to wait and welcome the ways of God in our lives. I have felt very run down and especially tired this year, and it causes me to wonder about the one life I have to live. How I can live it as well as possible, in step with God's Spirit and the yearnings of my heart? However, a particular source of joy has been the continuing discovery of Godly Play, and the possibility of doing small things well. I'm always so inspired by the Godly Play community, and especially by Sheila over at Explore and Express . As our church situations are very similar - just small seeds beginning to grow - we don't have weekly services, so often we do Godly Play at home as a family. However, Sheila's Advent Clubs seemed to be something we could offer to a few other children. So today, and for the next three Saturday mornings of Advent, we are meeting in our home with five or six children. I can't tell you how nice it is to get to know these children better! Today, as it was our first time together, and we come from a totally non-liturgical church, I took the time to explain what Advent is, using the Godly Play story of the Circle of the Church Year and the Advent wreath - they were fascinated! Another possibility for the children was to make a gift for the birds - which they had loved and wonderfully named in the Parable. We used more pine cones dipped in soft vegetable fat and then rolled in bird seed. You can find a simple tutorial here. We enjoyed a well-earned feast together, but it was just wonderful watching the crowds of different birds coming to enjoy their feast. Wishing you a very joyful Advent!